Breakfast at Sizzler buffet restaurant. Enjoy a 2 Hour Boat Trip on the Picturesque Crystal River. 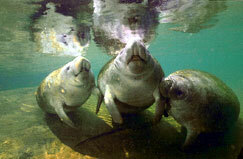 Have a Chance to Swim and Snorkel where the manatee live! Box Lunch at Homosassa Springs Wildlife State Park. Take a 20-minute narrated boat trip along Pepper Creek. See Tigers, Lions, Raccoons, Kangaroos, Gators and Much More!! Experience an Awesome 45 minute fully Narrated AirBoat tour on the Withlacochee River. Welcome to downtown Orlando, FL. Home of attractions like Disney, Sea World, and Universal Studios. However, you will be hard pressed to find any nature or wildlife in this cement city. Take an eco-adventure trip to the west side of Florida. There is a lot to explore. Yet, with this tour, it's convenient enough to do in one day. A full day of fun requires an early start. However, the friendly crew understands that breakfast is the most essential meal of the day. After eating a buffet breakfast the chartered bus took us on a 90-minute bus ride. If the view isn't enough to capture your attention, a movie is provided to entertain you. The tour guide informed us of interesting Florida facts and important information to know about the manatees that we were about to swim with in Crystal River. 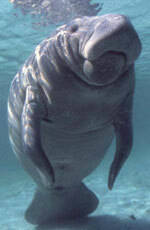 One of them being that it is illegal to touch a manatee with both hands. Swimming with the manatees is not required. You can take the boat ride just have the opportunity to gaze upon them. However, I would strongly recommend putting the fins on and snorkeling with the manatee. The water is around 72 F. Warm enough if you keep moving around, but wet suits can be attained to provide extra warmth. I got to touch, see, and swim with a manatee! Something very enjoyable! Lunch at Homosassa Springs Wildlife State Park, then off to view some Florida wildlife. This park provides habitat for animals that could not make it in the wild such as: a hippo, alligators, manatees, bobcats, deer, a black bear, bobcats, a cougar, and birds of prey. An enjoyable way to walk off lunch and view Florida wildlife. Finally a trip to alligator country. Of course the best way to see alligators, is on an airboat. We arrived at Wild Bill's Airboat Adventure on the Withlacochee River. I held their 'pet' alligator. He was about 2_ years old and around 2 feet. His jaw was tapped. The alligator was much softer then I thought he would be. We then were privileged on viewing a feeding of two of the huge alligators. Needless to say I was thankful there was a fence between the alligator and myself. The airboat accommodated around 16-18 people. Beautiful landscape around us. We did not get the opportunity to see any alligators, but it also started raining on us. Rain on an airboat is not exactly the most fun in the world. However, we did get to view some turtles and herons. It was fun riding in an airboat and viewing the Florida landscape in places that we could never get to by car or foot. Besides, it's not like we could have gotten as close as we did to the others that we had just seen. Word to the wise; bring a swimsuit, extra change of clothes (just in case), an underwater camera, and a book to read for the road trip, bug repellent, and a good attitude. The weather is not the thing that will stop the adventure. It will only be a bad attitude. This adventure is a great way to do a variety of things in one day. Great for a variety of ages, good bonding time with family, and you will definitely have a story to tell when you go back home.